Yahoo CEO Marissa Mayer says the Internet company now has over 800 million worldwide users, a 20 percent increase since she was lured away from Google 15 months ago to steer a turnaround. The gain disclosed Wednesday at technology conference TechCrunch Disrupt in San Francisco is the latest evidence of the progress that Yahoo Inc. is making under Mayer's leadership. The Sunnyvale, Calif., company's stock has nearly doubled since Mayer came aboard, though she and analysts say that gain primarily stems from the value of Yahoo's holdings in China's rapidly growing Alibaba Group. Mayer says the figure for the 800 million Yahoo users doesn't include the traffic that the company has picked up from its $1.1 billion acquisition of Internet blogging service Tumblrearlier this year. 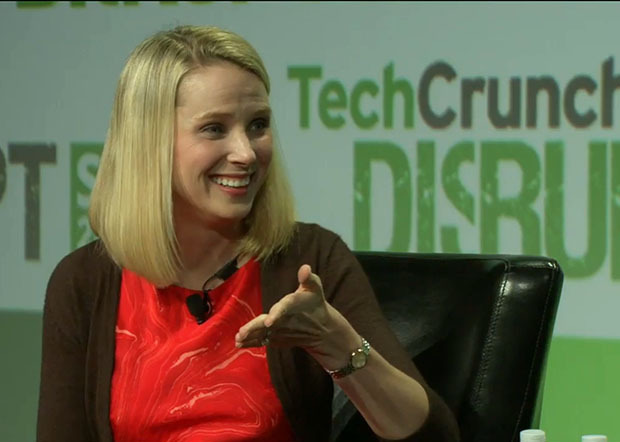 Mayer says Yahoo's current focus is on personalization and mobile. Despite the increased traffic, Yahoo is still struggling to boost its online advertising revenue -- the main way that the company makes money. In recent quarters, Yahoo's ad revenue has been barely rising while Google and another rival, Facebook Inc., have been thriving. Mayer added that Yahoo now gets 12,000 resumes a week -- growth by a factor of five or six. That's one resume per week for each of the 12,000 jobs at Yahoo. Mayer says she believes it her strategy for accelerating Yahoo's revenue growth will require at least three years to unfold. Yahoo's stock shed 29 cents Wednesday to close at $29.19.